, a very able mineralogist, was born in Dauphiny, June 24, 1750. Of his early history our authorities give but a confused account. He was inspector of the mines, and commander of the order of Malta. He first went to sea at the age of eighteen, when being insulted by one of his companions, who was on board the same ship, he fought and killed him; for which, on his return to Malta, he was sentenced to death by the chapter of the order. The grand-master, however, granted him his pardon, but as it was necessary that it should be confirmed by the pope, and as his holiness was at that time out of humour with the knights, he remained inflexible, and Dolomieu was confined for nine months in a dungeon in the island. He afterwards resumed his studies, and accompanied the regiment of carabineers in which he was an officer. 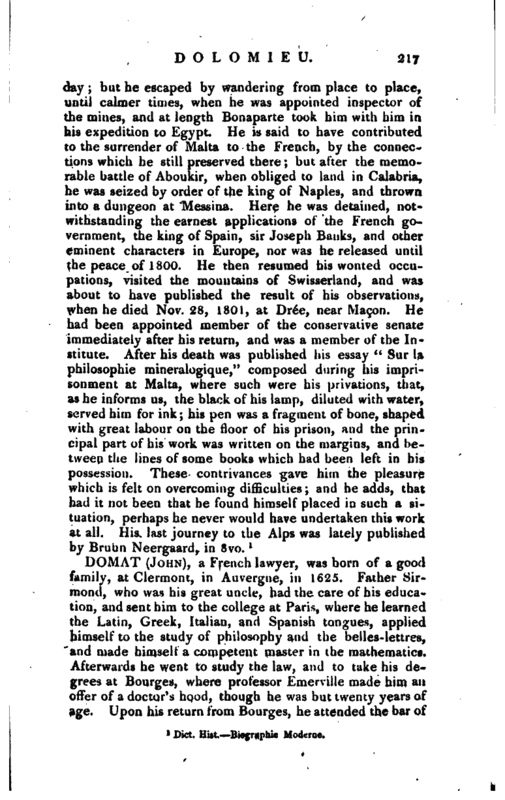 At Metz he took his first lessons in chemistry and natural history, and his progress became so rapid, that the academy of sciences granted him the title of corresponding member, which favour attached him entirely to natural philosophy. 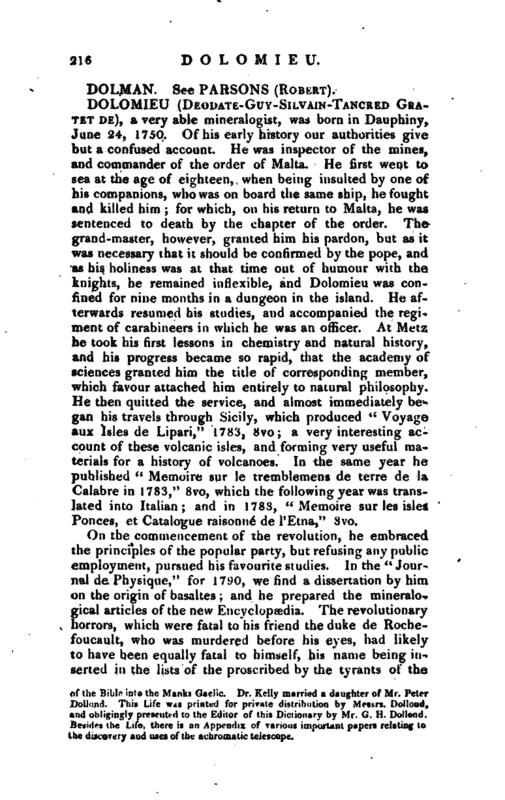 He then quitted the service, and almost immediately began his travels through Sicily, which produced “Voyage aux Isles de Lipari,” 1783, 8vo; a very interesting account of these volcanic isles, and forming very useful materials for a history of volcanoes. In the same year he published “Memoire sur le tremblemens de terre de la Calabre in 1783,” 8vo, which the following year was translated into Italian; and in 1788, “Memoire sur les isles Ponces, et Catalogue raisonne de PEtna,” 8vo. 1 Dict. Hist. Biographic Moderne.